What Is a Beef Rib Roast? 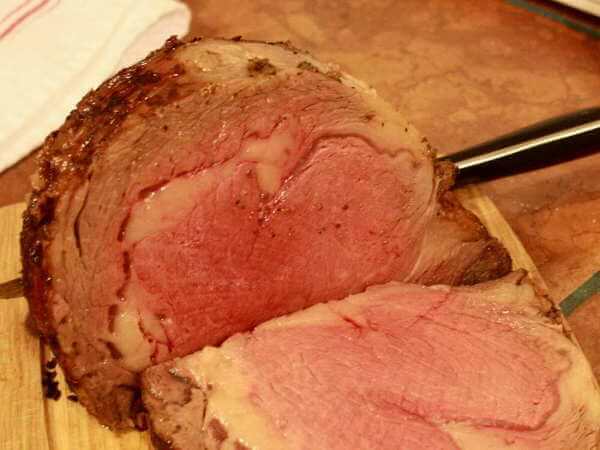 Commonly called prime rib or standing rib roast, this cut is taken from the front quarter of the beef, and includes ribs six through twelve and also part of the backbone. The whole rib roast is large, so it's usually divided into two separate roasts -- the small end and the large end. 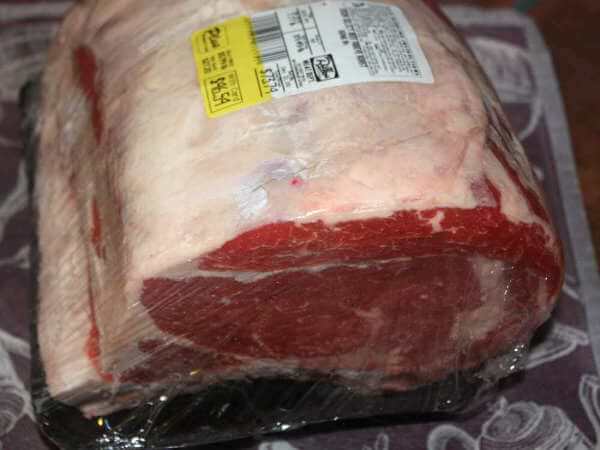 The large end of the rib roast is located towards the front, near the shoulder, or chuck area. The small end contains only one muscle, and is a bit more tender than the large-end roast. Each two ribs of the roast will serve from 3 to 4 people. Score the fat on the roast in a criss-cross pattern. Cut just through the fat so the meat is visible. This will let the seasonings reach the meat on the fat side. Mince the garlic, or crush to a paste. Add the garlic to one tablespoon of the olive oil, then rub it over the entire surface of the roast. Season with a generous amount of salt and pepper. Wrap the roast in plastic wrap and let it rest for at least an hour at room temperature. The beef rib roast will cook more evenly if it starts smoking when it's warmed up to 60 degrees Fahrenheit or so. It'll cook quicker, too. This is one piece of meat you don't want to over-smoke. Use a small amount of oak or fruit wood (apple or pear are good), and smoke the roast bone-side down. Keep the smoker temperature close to 225 degrees Fahrenheit. It can take anywhere from two to five hours to complete your rib roast. The main thing to watch is the internal temperature of the roast. I use a remote thermometer so I can monitor the temp without opening up the smoker. The temperature of the roast will rise a few degrees after it's taken out of the smoker. It needs to be removed when it reaches a temperature about 5 degrees under the target temperature. Here's a temperature chart to use when cooking a beef rib roast recipe. When the internal temperature of the rib roast (at the center of the larger end) reaches the "Remove At..." temperature, take it out of the smoker and let it rest on the counter top covered loosely with aluminum foil. During the rest, the temperature will continue to rise a bit, and the juices will reabsorb into the meat fibers. Don't skip the resting period - it's absolutely required if you want the beef rib roast (or any cut of meat, for that matter), to reach it's ultimate flavor and texture. This smoked rib roast recipe is perfect for holidays or other special occasions. Give it a try. It's on my Christmas menu again this year!